The Republican primary in Mississippi's U.S. Senate race has been largely overtaken in recent weeks by the bizarre news that a conservative bloggerwas arrested for taking pictures of Sen. Thad Cochran's ailing wife in a nursing home that he used in a video attacking Cochran. The blogger, Clayton Thomas Kelly, supports Cochran's opponent, state Sen. Chris McDaniel. Kelly has been arrested along with three others in connection with the incident, including a member of the board of the Central Mississippi Tea Party. And although McDaniels' campaign has denied any connection, the issue has stayed in the race - in part because Cochran's campaign won't let the public forget it. "It's the worst: Chris McDaniel's supporter charged with a felony for posting video of Sen. Thad Cochran's wife in a nursing home? Had enough?" asked one Cochran ad. Cochran's wife, Rose, who suffers from dementia, has lived in a Mississippi nursing home for the past 13 years. The Cochran ad prompted McDaniel to respond with his own ad, combining a complaint about the smears with a bid for the job. 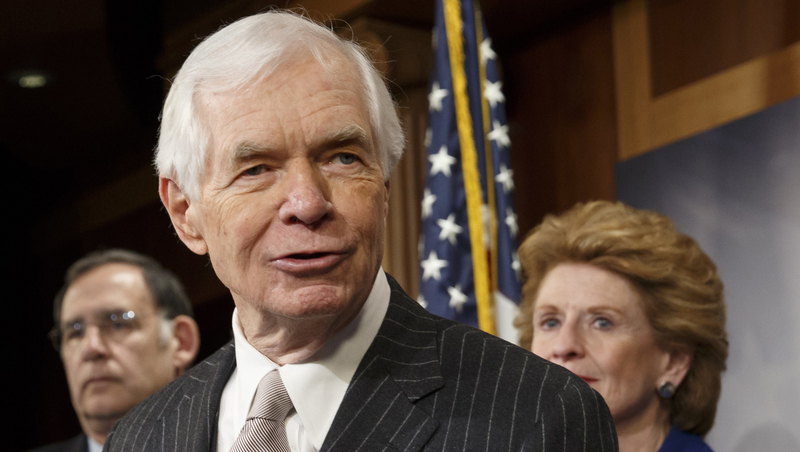 "You've probably seen Thad Cochran's negative attack ads. Newspapers call them shameless. I call them outrageous. But nobody said changing Washington, D.C. was going to be easy" he says in a response ad that also reminds viewers of his priorities. The negativity has mostly been limited to television ads. At a campaign event in Hattiesburg, Miss., this week Cochran said he was leaving the matter to the authorities and said he wasn't sure why it had happened. "It was kind of amateurish. I don't know quite any other way to describe it," he told reporters, including the Associated Press, after the event. "Obviously, I don't know what, I assume, motivated through some private political interest that they thought could be derived from that. But that's beyond my understanding." The race has been bitter and personal on both sides. McDaniel's supporters have raised questions about Cochran's relationship with his executive assistant, Kay Webber, the New York Times reports. Cochran rents a basement apartment in Webber's Capitol Hill townhouse and has twice rented out the first floor for fundraisers. She has also accompanied him on 28 trips to foreign countries and 39 trips to Mississippi from 2011 to 2013 despite having no particular policy expertise. The Cochran campaign told the Times that the travel is "strictly professional" and "perfectly appropriate as a senior staff member."